Today is which is a good date to work on avoiding a dehydrated condition by drinking sufficient water and other drinks, especially if involved in sports... Dehydration means your body does not have as much water and fluids as it should and as a result a dehydrated condition sets-in. Dehydration can be caused by losing too much body fluid, not drinking enough water or fluids, or both. Vomiting and severe diarrhea are common dehydration causes. Infants and children are more susceptible to dehydration vs adults because of kids low body weight and higher turnover of water and electrolytes. The elderly and those with chronic illnesses are also at high-risk. Dehydration is classified as mild, moderate, or severe based on how much of the body's fluid is lost or not replenished. When severe, dehydration is a life-threatening emergency. In addition to the symptoms of actual dehydration, you may also have vomiting, diarrhea, or the feeling that you "can't keep anything down," all of which could be causing the dehydration. 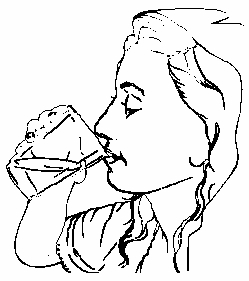 Drinking fluids is usually sufficient for mild dehydration. It's better to drink frequent but small amounts of liquid (using a teaspoon or syringe for infants or children) instead of trying to force large amounts of fluid at one time. Drinking too much fluid at once can bring on vomiting and a worse dehydrated condition. Electrolyte solutions or freezer pops are especially effective. These are available at drug stores. Sport drinks contain a lot of sugar and can cause or worsen diarrhea in infants and other young children. Kids who get dehydrated should also avoid using water as the primary replacement fluid. Intravenous fluids and hospitalization may be needed for moderate or severe dehydration. The doctor will try to identify and then treat the cause of the dehydration. When dehydration is recognized and treated promptly, the medical outcome is generally good. Untreated severe dehydration may result in seizures, permanent brain damage, or even death in extreme cases. Also call your doctor if you are not sure whether your attempts to give your child proper fluids are working. Even when healthy, drink plenty of fluid every day. Drink more when the weather is hot or when exercising. Carefully monitor someone who is ill, especially involving infants, toddlers, teenage children and adults too. If you believe dehydration is developing, consult a doctor before the person becomes moderately or severely dehydrated. Begin fluid replacement as soon as vomiting and diarrhea start -- DO NOT wait for signs of dehydration. Always encourage younger children to drink plenty of fluid during illnesses, and remember body fluid needs are much higher with a fever, vomiting or diarrhea. The easiest signs to monitor are urine output (there should be frequent wet diapers or trips to the bathroom), saliva in the mouth, and tears when crying. Have you ever spent a hot afternoon playing ball with your friends or running around the park with your dog? Bet you were pretty sweaty and thirsty when you finished playing — maybe even thirsty enough to guzzle an entire gallon of water. This thirst was a sign of dehydration. Dehydration means your body is losing more fluids than it takes in — and that's not good! Don't depend on your thirst to tell you whether or not your body needs a refill. Make sure you drink water a few hours before gearing up for physical activities, and keep drinking liquids after you're done — do not let yourself become dehydrated. When your body temperature gets hotter than normal — 98.6 degrees — your brain sends out a distress signal which can cause you to sweat, which cools you down. Think of it this way — your body, like an air conditioner, has an internal thermostat helps control its temperature. Whenever your body heats up from physical activity or the hot weather outside, your internal air conditioner turns on and you begin to sweat. And remember, now your air conditioner is using its coolant (your sweat), it is important to refill the tank — by drinking lots of H2O. Ever wonder what really happens inside your body to make you sweat? Picture this ... when your temperature rises, tiny blood vessels close to your skin open up. This allows your blood to carry the heat in your body away from your hard-working muscles to get closer to the skin. Then, water (sweat) escapes through your sweat glands and on to your skin. When air blows over your wet skin, the sweat evaporates (dries up) and cools your body down. But, on really hot, humid days, there is so much moisture in the air it can't absorb the sweat from your body. So, to keep your body cool, drink plenty of water, use a fan, or take a dip in the pool. Top off your tank a few hours before you hit the court, the field, or your own backyard by drinking about 2 cups of cold water. Keep a water bottle handy to guzzle during water breaks, half-time, or time-outs. Try to drink about 10-ounces about a dozen gulps from your bottle of water bottle every 20- minutes or so. Did you know sometimes you can't even see sweat — like when you're swimming? Which means you may not realize you are getting dehydrated. Just another reason to keep your water bottle in plain sight so you'll remember to drink up! Even after the game ends, the chugging shouldn't — the more you sweat, the more water you need. Drink bottled water, water flavored with lime or lemon juice, or water right from your own sink. Eating fruit and other cool snacks is another way to keep your body well-hydrated and cool. Pack peaches, tangerines, honeydew melon, oranges, watermelon, cantaloupe and grapes in your cooler — they taste great and re-hydrate your body too. Play outside during cooler parts of the day — early morning or early evening. The day is usually hottest between 10 am and 4 pm, so find a shady bike path to ride or skate on, plan some indoor activities, take a dip in the pool, or play games under the sprinkler. If you choose to brave the heat, make sure to let your body gradually adjust. Cut back length and intensity of activities just for the first 2-weeks until you get used to the heat. Dress cool. Wear loose fitting clothing and lightly colored — preferably made of cotton or a sweat-wicking material (designed to pull sweat away from your skin). Stay away from dark-colored clothing like black and dark blue — they soak up sunlight and heat. Did you know almost one-fourth of all of your body's sweat glands are in your feet? What does that tell ya! To keep your feet cool and blister-free, try wearing shoes allow your feet to breathe and don't trap sweat and heat. Stay away from drinks have caffeine, lots of sugar, or carbonation in them — like soda or tea. If you're playing center field, practicing your back-hand, or in the playground for more than an hour get an extra energy boost from sports drinks. They help to replace the water you've lost during strenuous activity. Sports drinks are great when you're active, but not if you're just chillin' — they have high levels of sugar, salt, and potassium you don't really need unless you are working your body hard. Most importantly, listen to your body. If you feel weak, dizzy, or thirsty, take a break in the shade, grab your water bottle, and tell a grown-up. Now you know how to deal with the heat — get out, staying active, and keeping cool!